The Sentry Box, constructed in 1786, is located in downtown Fredericksburg near Caroline Street. The house was named by its most famous owner, General George Weedon (Embrey 135) . Weedon was proud of the home and often had elaborate dinner parties and gatherings at the house. Many looked forward to his Christmas celebrations held there (Harrison 4). 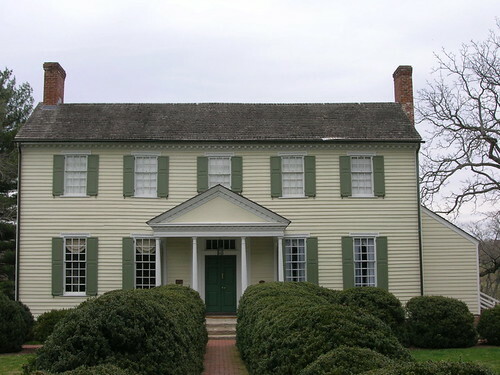 General Hugh Mercer owned the house after General Weedon, and his children inherited it after his death during the Revolutionary War. During the Civil War, the house was owned by the Mason family. Prior to the war, the owner, Wiley Mason, Jr. was a merchant and lived with his wife, Susan Mason. They had at least two children together and he was the owner of more than 11 slaves. Wiley Mason was enlisted in the Confederate army during the war and served as a lieutenant under General Charles Field. Mason was wounded and captured but survived the war (Harrison 3). The Sentry Box is still standing today, though it is currently private property. The Sentry Box was important to the Confederate side during the 1862 Battle of Fredericksburg. A Union bridge used to cross the Rappahannock was constructed near the house. Because of its location and proximity to the river, the house sustained heavy damages during the battle. Wiley Mason returned to his home after the fighting to discover five or six dead men on his property, all of which he had buried in a single grave. Confederates also dug deep ditches for protection across the yard that had to be repaired (Harrison 6). “Sentry Box,” Courtesy of Amy Benjamin, 2008. Embrey, Alvin T. History of Fredericksburg, Virginia. Richmond, VA: Old Dominion Press, 1937. Harrison, Noel G. Fredericksburg Civil War Sites: April 1861-November 1862. Lynchburg, VA: H.E. Howard, Inc., 1995. “Notes on “The Sentry Box”, Marker Program Research Reports, vol. 1. Fredericksburg, VA: Historic Fredericksburg Foundation, Inc.
Ward, Harry M. Duty, Honor or Country: General George Weedon and the American Revolution. Philadelphia: American Philosophical Society, 1979.